What makes good design? Find out with this free ebook series from Route1Print. Good design, much like anything, begins with a solid understanding of the basic principles. By building a strong foundation and mastering the fundamentals, you can quickly gain the skills you need to bring even your wildest creative visions to life. But where do you start? 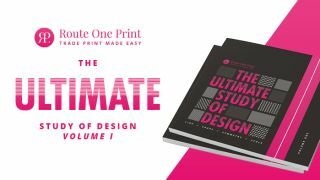 In the first of a series of free ebooks, The Ultimate Study of Design by Route 1 Print has everything to help you fully grasp the infrastructure of graphic design. Volume I kicks things off with some of the most fundamental elements of design - line, shape, composition and scale - features which are used to create designs and enhance user experience. Learn all about the different line types, their purpose, style and intentions, before moving on to an in-depth look at shapes and what they can mean for your designs. Symmetry and asymmetrical design is also on the agenda, and last, but by no means least, the subject of scale, including balancing design elements, how to use the golden ratio and how scale can be used to fully communicate your artwork. Alongside all the in-depth technical advice, The Ultimate Study of Design also features an inspirational case study on Sony’s upcoming movie Venom. Based on the Marvel comic book character, The Ultimate Study of Design takes a closer look at the decision to create a symmetrical identity for the alien character whose eyes have always been represented, in the comics, as unpredictable, asymmetric forms. Download the ebook now for more details and see what you think. By the time you’re done with all this amazing content, the team at Route1Print will be ready to keep you busy with Volume II, featuring colour, texture, pattern, repetition and depth. So what are you waiting for? Download your copy of The Ultimate Study of Design today and become a design pro!